Agadir (Berber: ⴰⴳⴰⴷⵉⵔ; Arabic: أكادير‎ or أݣادير or أغادير) is a major city in mid-southern Morocco. Agadir is located on the shore of the Atlantic Ocean near the foot of the Atlas Mountains, just north of the point where the Sus River flows into the ocean. It is 508 km south of Casablanca. It is the capital of the Agadir Ida-U-Tanan Prefecture and of the Sus-Massa economic region. A majority of its inhabitants speak Tashelhit Berber, one of the varieties of the Berber language. Agadir is one of the major urban centres of Morocco. The municipality of Agadir recorded a population of 421,844 in the 2014 Moroccan census. According to the 2004 census, there were 346,106 inhabitants in that year and the population of the Prefecture of Agadir-Ida Outanane was 487,954 inhabitants. Three languages are spoken in the city: Tashelhit (first language of the majority), Moroccan Arabic, and French. The city was destroyed by an earthquake in 1960; it has been completely rebuilt with mandatory seismic standards. It is now the largest seaside resort in Morocco, where foreign tourists and many residents are attracted by an unusually mild year-round climate. Since 2010 it has been well served by low-cost flights and a motorway from Tangier. The city attracts all walks of life; it has had an annual growth rate of over 6% per year in housing demand while housing production barely exceeds 3.4%. The mild winter climate (January average midday temperature 20.5 °C/69 °F) and good beaches have made it a major "winter sun" destination for northern Europeans. The name Agadir is a common Berber noun agadir meaning "wall, enclosure, fortified building, citadel". This noun is attested in most Berber languages, and may be a loanword from Phoenician-Punic, a Semitic language spoken in North-Africa until the fifth century CE. There are many more towns in Morocco called Agadir. The city of Agadir's full name in Tashelhit is Agadir n Yighir, literally "the fortress of the cape", referring to the nearby promontory named Cape Rhir on maps (a pleonastic name, literally "Cape Cape"). A single male inhabitant or native of the town is known in Tashelhit as a gg ugadir (also a common surname, "Gougadir" in French spelling), plural ayt ugadir "men of Agadir" (also collective name, "men and women of Agadir, people of Agadir"); a single feminine inhabitant is a ult ugadir "woman of Agadir", plural ist ugadir "women of Agadir". In Moroccan Arabic, an inhabitant is a agadiri, plural agadiriyin, feminine agadiriya, plural agadiriyat. Little history is recorded on Agadir before the 12th century. In the 2nd century AD, the historian Polybius referred to North Africa on the Atlantic, a place called cap Rhysaddir, that may have been located near Agadir but its location is still under debate. The oldest cartographic mention of Agadir is on a map from 1325: at the approximate location of the modern city there was an indication of a place called Porto Mesegina, after the name of a Berber tribe already mentioned in the 12th century, the Mesguina, that is to say the Ksima. At the end of the medieval period, Agadir was a town of some notoriety. The name itself, Agadir al-harba, was attested to for the first time in 1510. In 1505, the Portuguese, who were already installed on the Moroccan coast, founded a trading post and a fort at the foot of the hill to the sea, Santa Cruz do Cabo de Aguer on the site of the now-vanished neighborhood of Founti (named after the Portuguese word fonte meaning fountain) under a governor. Quickly, the Portuguese were exposed to the hostility of the tribes of the region. From 1530, they were blockaded in Santa Cruz. Portuguese weakness showed itself on 12 March 1541 when Sherif Saâdien Mohammed ash-Sheikh captured the fortress of Santa Cruz de Aguer. Six hundred Portuguese survivors were taken prisoner, including the governor, Guterre de Monroy, and his daughter, Dona Mecia. The captives were redeemed by the holy men mostly from Portugal. Dona Mecia, whose husband was killed during the battle, became the wife of Sheikh Mohammed ash-Sheikh but died in childbirth in 1544. In the same year, Mohammed ash-Sheikh released the Governor Guterre de Monroy, whom he had befriended. The Portuguese possessions in Morocco, acquired between 1505 and 1520, were regressing. After the loss of Agadir, the Portuguese were obliged to abandon Safi and Azemmour. Morocco was beginning to be less important for Portugal which now turned to India and Brazil. After 1550, the Portuguese no longer held anything in Morocco other than Mazagan (now El Jadida), Tangier and Ceuta. The story of the Portuguese presence (from the installation in 1505 until the fall on 12 March 1541) is described in manuscript (published for the first time, with French translation, by Pierre de Cenival in 1934) entitled "ESTE HE O ORIGEM E COMEÇO E CABO DA VILLA DE SANTA CRUZ DO CABO DE GUE D'AGOA DE NARBA", written by anonymous who was captured in 12-III-34 and was five years inprisioned in Taroudannt (cf. "Santa Cruz do Cabo de Gue d'Agoa de Narba – Estudo e Crónica", Joao Marinho e Santos, José Manuel Azevedo e Silva e Mohammed Nadir,bilingual edition, Viseu 2007). In 1572, the Casbah was built on top of the hill by Moulay Abdallah al-Ghalib, successor to Mohammed ash-Sheikh. It was now called Agadir N'Ighir, literally: fortified granary of the hill in Tachelhit. In the 17th century, during the reign of the Berber dynasty of Tazerwalt, Agadir was a harbour of some importance, expanding its trade with Europe. There was, however, no real port nor a wharf. Agadir traded mainly in sugar, wax, copper, hides and skins. Europeans took their manufactured goods, particularly weapons and textiles. Under the reign of Sultan Moulay Ismail (1645–1727) and his successors, the trade with France, until then an active partner regressed to the English and the Dutch. In 1731, the town was completely destroyed by an earthquake. The harbour of Agadir was then ordered to be closed when Essaouira was established farther north. In 1746, the Dutch set up a trading post at the foot of the Casbah under the authority of the Sultan, and undoubtedly participated in the restoration of the city. Above the door of the Casbah, the Dutch inscription can still be seen with its transcription in Arabic: "Vreest God ende eert den Kooning", which means "Fear God and honour the King", and the date 1746. After a long period of prosperity during the reigns of the Saadian and Alawite dynasties, Agadir declined from 1760 because of the pre-eminence given to the competing port of Essaouira by the Alawite Sultan Mohammed ben Abdallah who wanted to punish the Souss for rebelling against his authority. This decline lasted a century and a half. In 1789, a European traveler gave a brief description of Agadir: "It is now a ghost town, there are no more than a few houses and these are crumbling into ruins". In 1881, Sultan Moulay Hassan reopened the harbour to trade in order to supply the expeditions he planned in the south. These expeditions, which were to reassert his authority over the Souss tribes and counter the plans of English and Spanish, were held in 1882 and 1886. I walk along the shore to Agadir Irir. The road passes below the city, half-way between it and Founti: Founti is a miserable hamlet, a few fishermen's huts; Agadir, despite its white enclosure which gives it the air of a city is, I am told, a poor village depopulated and without trade. On the pretext of a call for help from German companies in the valley of the Souss, Germany decided on 1 July 1911, to extend its interests in Morocco and assert a claim on the country. It sent to the Bay of Agadir, (which harbour was, until 1881, closed to foreign trade) the SMS Panther which was quickly joined by the cruiser Berlin. Very strong international reaction, particularly from Great Britain, surprised Germany and triggered the Agadir Crisis between France and Germany. War threatened. After tough negotiations, a Franco-German treaty was finally signed on 4 November 1911, giving a free hand to France, who would be able to establish its protectorate over Morocco in return for giving up some colonies in Africa. It was only then that the gunboat Panther and the cruiser Berlin left the bay of Agadir. Due to a miscalculation, the German sales representative Hermann Wilberg, who was sent to provide the pretext for the intervention, only arrived at Agadir three days after the Panther arrived. In 1913, the cities (Agadir N'Ighir and Founti) totalled less than a thousand inhabitants. On 15 June 1913 French troops landed in Agadir. In 1916, the first pier was built near Founti – a simple jetty, later known as the "Portuguese jetty", which remained until the end of the 20th century. After 1920, under the French protectorate, a port was built and the city saw its first development with the construction of the old Talborjt district located on the plateau at the foot of the hill. Two years later, beside Talborjt along the faultline of the river Tildi construction of the popular district of Yahchech began. Around 1930, Agadir was an important stop for the French airmail service Aéropostale and was frequented by Saint-Exupéry and Mermoz. In the years from 1930, a modern central city began to be built according to the plans of the urban planner Henri Prost, director of the Urban Planning Department of the Protectorate, and his deputy Albert Laprade: a horseshoe layout based on the waterfront around a large avenue perpendicular to the waterfront – the Avenue Lyautey, since renamed Avenue du Général Kettani. In the 1950s, urban development continued under the direction of the Director of Urban Planning Morocco, Michel Ecochard. After 1950 and the opening of the new commercial port, the city grew with fishing, canning, agriculture, and mining. It also began to open up to tourism thanks to its climate and beautiful hotels. Several years later from 1950 to 1956 Agadir organised the Grand Prix of Agadir and, from 1954 to 1956, the Moroccan Grand Prix. In 1959, the port was visited by the yacht of the Greek shipping magnate Aristotle Onassis and his guest, Winston Churchill. By 1960, Agadir numbered over 40,000 residents when at 15 minutes to midnight on 29 February 1960, it was again almost totally destroyed by an earthquake of magnitude 5.7 on the Richter scale that lasted 15 seconds, burying the city and killing more than a third of the population. The death toll was estimated at 15,000. The earthquake destroyed the ancient Casbah. On seeing the destruction in Agadir, King Muhammad V of Morocco declared: "If Destiny decided the destruction of Agadir, its rebuilding depends on our Faith and Will." The current city was rebuilt 2 km further south, led by the architects Jean-François Zevaco, Elijah Azagury, Pierre Coldefy, and Claude Verdugo. Agadir became a large city of over half a million by 2004, with a large port with four basins: the commercial port with draft of 17 metres, triangle fishing, fishing port, and a pleasure boat port with marina. Agadir was the premier sardine port in the world in the 1980s and has a famous beach stretching over 10 km with one of the finest seafront promenades in the world. Its climate has 340 days of sunshine per year which allows for swimming all year round. The winter is unusually warm and summer heat is never oppressive (summer haze however is common). With Marrakech, Agadir is a very important centre for tourism to Morocco, and the city is the most important fishing port in the country. Business is also booming with the export of citrus fruit and vegetables produced in the fertile valley of Souss. The city is served by the Agadir–Al Massira International Airport. This area is named after the old district of Talborjt (meaning "small fort" in local Berber, in remembrance of the water tower which was first built on the plateau in the former Talborjt). Lively, the New Talborjt which has been rebuilt away from the Old Talborjt, has as a main artery the Boulevard Mohammed Sheikh Saadi, named after the victor against the Portuguese in 1541. Other major avenues are the Avenue President Kennedy and the Avenue February 29. There is also the Mohammed V mosque, the Olhão garden (Olhão is a coastal city in southern Portugal that is twinned with Agadir) and its memorial museum and the garden Ibn Zaydoun. Some good hotels and restaurants have been built on the main arteries. Swiss Village: the oldest district of villas bordered by the Avenue of FAR (Royal Armed Forces), Avenue Mokhtar Soussi, Cairo Avenue, and the Avenue of the United Nations. Mixed Sector District: the French and Spanish Consulates are in this district. Founty or "Bay of palm trees": a seaside area with residential villas, large hotels, holiday homes, and the royal palace. High Founty: a new district of buildings and residential villas, located in the new city centre between the new Court of Appeal and the Marjane supermarket. Illigh: to the east in front of the Hassan II hospital, is a residential area of large villas, housing the "new bourgeoisie". Charaf: The Hassan II hospital is in this district. Les Amicales: also known as the "city of bureaucrats". Dakhla: close to the faculty of Ibnou Zohr, it has a great mix between modern buildings, ordinary villas, and studio apartments. Hay Mohammadi: a new urbanization zone in Agadir with a villa zone and a zone for large groups of buildings to frame the extension of the Avenue des FAR in the northwest. Adrar City: a new district next to the Metro hypermarket. Over the decades, Agadir has had several ports: two fishing ports, a major trading port, and the recent port for leisure boats with its marina. The Avenue du Port, the main artery of the Anza district, is surrounded by canneries and has many popular small restaurants adjacent to the fish market. The fishing port is one of the premier major sardine ports in the world. The commercial port is also known for its exports of cobalt, manganese, zinc and citrus products. The Casbah (Agadir Oufella, Agadir le haut, Agadir N'Ighir, or Agadir de la colline) was, along with Founti by the sea, the oldest district of Agadir. An authentic fortress with winding streets and lively, the Casbah was built in 1572 by Moulay Abdallah al-Ghalib. Above the front door; today, the original inscription in Arabic and in English reads: "Fear God and honour the King." Of this fortress there remains, after the earthquake of 29 February 1960, a restored long high wall that surrounds land that is not buildable. The view, however, is exceptional over the bay of Agadir and the ports. The old people of Agadir remember the famous "Moorish café" of the Casbah and its panoramic view. The hill bears the inscription in Arabic: "God, Country, King" which, like the walls, is illuminated at night. Overlooking the waterfront and Wadi Tildi, this old district (whose name is sometimes spelled Talbordjt) was once a shopping area and very lively with its large square where there was a weekly market, hotels, schools, mosque 90% of the buildings in Old Talborjt were destroyed or severely damaged by the earthquake in 1960. Razed to the ground after the earthquake and now overgrown, it is classified as non-buildable area. Its main thoroughfare, the Avenue El Moun stretches over 2 km and serves only for driving schools who teach their students to drive. One of the most popular neighbourhoods, it is known for its Square for taxis and buses. It is a junction that unites the heart of the city and its surroundings. This district was the least affected by the earthquake of 1960. This is the largest market in the region. It has about 6,000 small shops. It is surrounded by walls and has several entrances. It is organized into different sectors: furniture, crafts, clothing, vegetables, meat, spices etc. It is possible to find all kinds of handicrafts and traditional decorations. The walls have been restored and the interior design is being finished. La Médina is a handicrafts space created in 1992 by the Italian artist Coco Polizzi, at Ben Sergao, a district close to Agadir 4.5 km from the city centre. Built using techniques of traditional Berber construction, it is a kind of small open-air museum, on five hectares and home to artisan workshops, a museum, individual residences, a small hotel, and an exotic garden. Aourir 001.05.03. Rural commune 5571 27483 55 27428 21810 residents live in the center, called Aourir; 5673 residents live in rural areas. Drargua 001.05.09. Rural commune 6910 37115 1 37114 17071 residents live in the center, called Drargua; 20044 residents live in rural areas. Agadir features a hot semiarid climate (Köppen: BSh ) with warm summers and mild winters. Located along the Atlantic Ocean, Agadir has a very temperate climate. The daytime temperature generally stays in the 20s °C (70s °F) every day, with the winter highs typically reaching 20.4 °C or 68.7 °F in December and January. Rainfall is almost entirely confined to the winter months and is heavily influenced by the NAO, with negative NAO indices producing wet winters and positive NAO correlating with drought. For instance, in the wettest month on record of December 1963, as much as 314.7 millimetres or 12.39 inches fell, whereas in the positive NAO year from July 1960 to June 1961 a mere 46.7 millimetres or 1.84 inches occurred over the twelve months. The wettest year has been from July 1955 to June 1956 with 455.5 millimetres or 17.93 inches. Occasionally however, the region experiences winds from the Sahara called Chergui, which may exceptionally and for two to five days raise the heat above 40 °C or 104 °F. Agadir's economy relies mainly on tourism and fisheries. Agricultural activities are based around the city. The city has a cement company called Ciments du Maroc (CIMAR), a subsidiary of the Italian group Italcementi which is in process of being transferred to a new plant 40 kilometres from the city. There is also a shipyard in the port and the only Merchant Marine school in Morocco. Agadir is served by Al Massira Airport, located 22 kilometres from the city. With the opening of the new Casablanca–Agadir expressway in June 2010, which runs from Casablanca via Marrakech to Agadir, access to the region is much improved. For freight there is also a port, and for pleasure-craft there is a marina in Agadir. ALSA was introduced in 2010 to provide bus services in Agadir. The Timitar festival, a festival of Amazigh and music from around the world, has been held in Agadir every summer since its inception in July 2004. Noiz Makerz concert of urban music. Musée de Talborjt "La Casbah"
The city of Agadir has a university: the University Ibn Zuhr which includes a Faculty of Science, Faculty of Law, Economics and Social Sciences, the Faculty of Arts and Humanities, and the multi-disciplined Faculty of Ouarzazate. the Graduate School of Agadir technology (ESTA). There is an international French school: the French School of Agadir and also public schools: Youssef Ben Tachfine School, Mohammed Reda-Slaoui School, and the Al-Idrissi Technical College. Grand Stadium of Agadir the new stadium for Agadir. The Botola side Hassania Agadir is the local football team of Agadir. They play their home matches at the Stade Al Inbiaâte. The Hassan II Golf Trophy and Lalla Meryem Cup golf tournaments of the European Tour and Ladies European Tour are held at the Golf du Palais Royal in Agadir since 2011. Abbes Kabbage (died 1 May 1984) was a regional leader of the Istiqlal Party before joining the UNFP in 1960. Val Fouad, author of "Agadir", published by Editions Alan Sutton. Dominique Strauss-Kahn spent his childhood there from 1951 to 1960. Some of the most beautiful beaches in Morocco are located to the north of Agadir. Areas also known for excellent surfing are located near Taghazout village to Cap Ghir. Many smaller and clean beaches are located along this coast. Some of them between Agadir and Essaouira are: Agadir Beach, Tamaounza (12 km), Aitswal Beach, Imouran (17 km), Taghazout (19 km), Bouyirdn (20 km), Timzguida (22 km), Aghroud (30 km), Imiouadar (27 km). The beaches of Taghazout and Tamraght. A large tourism development project in the Bay of Taghazout, Taghazout-Argana Bay was launched in 2007. Agadir is also one of the first names of the city of Tlemcen in Algeria. Agadir is referenced in the Mike Batt song Ride to Agadir. ^ "Climate (Average Weather) Data", from NOAA Station Id FM60250, Latitude: 30° 23'N Longitude: 9° 34'W Elevation: 23m Archived 2013-08-16 at the Wayback Machine. ^ See K. Naït-Zerrad, Dictionnaire des racines berbères, Ḍ-G, Louvain: Peeters, 2002, p. 734. ^ Cf. Hebrew gādēr "wall, place fortified with a wall" (see S.P. Tregelles, Gesenius' Hebrew-Chaldee lexicon, Grand Rapids: Eerdmans, 1949, p. 160, which also mentions Classical Arabic jadīr "a place surrounded by a wall"). ^ Ighir (pronounced irrhir) that is to say shoulder, then height. ^ "Historic Earthquakes". Earthquake.usgs.gov. Archived from the original on 2012-05-08. Retrieved 2012-03-14. ^ Maurice Barbier (1982). Le conflit du Sahara occidental (in French). Harmattan. p. 48. ISBN 978-2-85802-197-0. ^ "Extreme Temperatures Around the World". Mherrera.org. Retrieved 2014-06-16. ^ "Agadir Climate Normals 1961–1990". National Oceanic and Atmospheric Administration. Retrieved August 15, 2017. 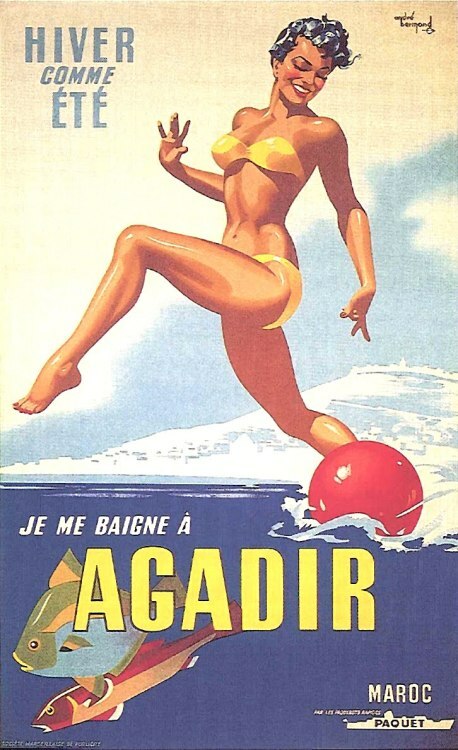 ^ "Agadir". UN-Habitat. Archived from the original on 2007-06-29. Retrieved 2009-08-06. ^ "Italcementi". Italcementigroup.com. Retrieved 2014-06-16. ^ "''Maroc Movement'' association". Facebook.com. Retrieved 2014-06-16. ^ "Saphia Azzedine "Zorngebete", 2012, French Institute of Germany, consulted on 7 March 2013 (De)". Institutfrancais.de. Archived from the original on 27 April 2014. Retrieved 2014-06-16. ^ Ait Ider Mohamed. "Taghazout beaches, the best beaches of Agadir". Taghazout.biz. Retrieved 2012-03-14. ^ "Sister Cities". Agadirnet.com. Retrieved 2014-06-16. ^ محمد جواد مطلع (2010-06-12). "Sister Cities of Shiraz". Eshiraz.ir. Archived from the original on 2011-09-27. Retrieved 2014-06-16. The 1960 Agadir earthquake occurred 29 February at 23:40 Western European Time near the city of Agadir, located in western Morocco on the shore of the Atlantic Ocean. Despite the earthquake's moderate Mw scale magnitude of 5.8, its relatively shallow depth (15.0 km) resulted in strong surface shaking, with a maximum perceived intensity of X (Extreme) on the Mercalli intensity scale. Between 12,000 and 15,000 people (about a third of the city's population of the time) were killed and another 12,000 injured with at least 35,000 people left homeless, making it the most destructive and deadliest earthquake in Moroccan history. Particularly hard hit were Founti, the Kasbah, Yachech (iḥšaš) and the Talbordjt area. The earthquake's shallow focus, close proximity to the port city of Agadir, and unsatisfactory construction methods were all reasons declared by earthquake engineers and seismologists as to why it was so destructive. The 2015–16 Botola, also known as Botola Maroc Telecom for sponsorship reasons, is the 59th season of the Premier League, the top Moroccan professional league for association football clubs, since its establishment in 1915. The fixtures were announced on 22 July 2015. The season started on 5 September 2015 and is scheduled to conclude on 15 April 2016. Wydad came into the season as defending champions of the 2014–15 season. Ittihad Tanja and MC Oujda entered as the two promoted teams from the 2014–15 GNF 2. On June 5th 2016, FUS Rabat won the football championship after a 4-2 victory against Mouloudia D'Oujda. The FUS Rabat club won the championship for the first time after being runner-up to the title for 5 previous times. The 2017–18 Botola, also known as Botola Maroc Telecom for sponsorship reasons, is the 61st season of the Premier League and the 7th under its new format of Moroccan Pro League, the top Moroccan professional league for association football clubs, since its establishment in 1956. The season started on 8 September 2017 and ended on 21 May 2018. Wydad Athletic Club came into the season as defending champions of the 2016–17 season. Rapide Oued Zem and Racing de Casablanca entered as the two promoted teams from the 2016–17 GNF 2. On May 12th 2018, Ittihad Tanger won the Botola Pro after a 2-1 victory against Moghreb Tétouan. The IR Tanger club won the championship for the first time after being runner-up to the title in 1989-90 season. The Agadir Crisis, Agadir Incident or Second Moroccan Crisis (also known as the Panthersprung in German) was a brief international crisis sparked by the deployment of a substantial force of French troops in the interior of Morocco in April 1911. Germany did not object to France's expansion but wanted territorial compensation for itself. Berlin threatened warfare, sent a gunboat, and stirred up angry German nationalists. Negotiations between Berlin and Paris resolved the crisis: France took over Morocco as a protectorate in exchange for territorial concessions to Germany from the French Congo, while Spain was satisfied with a change in its boundary with Morocco. The British cabinet, however, was alarmed at Germany's aggressiveness toward France. David Lloyd George made a dramatic "Mansion House" speech that denounced the German move as an intolerable humiliation. There was talk of war, and Germany backed down. Relations between Berlin and London remained sour. Agadir Melloul is a small town and rural commune in Taroudant Province of the Souss-Massa-Drâa region of Morocco. At the time of the 2004 census, the commune had a total population of 8756 people living in 1307 households. Agadir – Al Massira Airport (Arabic: مطار المسيرة‎, transliterated: Matar al-Maseera, French: Aéroport Al Massira; IATA: AGA, ICAO: GMAD) is an international airport serving Agadir, a major city in southwest Morocco and the capital of Souss-Massa region. The airport is located in the commune of Temsia, 20 km southeast of Agadir proper. In 2007, Al Massira International Airport served 1,502,094 passengers. In later years, Agadir and its tourism boomed, having new flights introduced to Al Massira from new airports from the United Kingdom and Ireland. The Botola (Arabic: البطولة‎), literally "the Moroccan Championship" (known as Botola Maroc Telecom for sponsorship reasons) is a Moroccan professional league for men's association football clubs. At the top of the Moroccan football league system, it is the country's primary football competition. Contested by 16 clubs, it operates on a system of promotion and relegation with the Football League. The Premier League is a corporation in which the 16 member clubs act as shareholders, Seasons run from August to May, with teams playing 30 matches each (playing each team in the league twice, home and away) totalling 214 matches in the season. Most games are played in the afternoons of Saturdays and Sundays, the other games during weekday evenings. It is sponsored by Maroc Télécom and thus known as the Botola-Ittisalat. Outside England, it is commonly referred to as the Moroccan Premier League (MPL). The competition formed as the FRFM on 20 February 1992 following the decision of clubs in the Botola Pro to break away from the UNAF, which had been founded in 1911, and take advantage of a lucrative television rights deal. This deal is worth MAD 55 million a year domestically as of 2015–16, with Arryadia securing the domestic rights to broadcast games respectively. The league generates MAD 123 million per year in domestic and international television rights. The Botola Pro is the most-watched football league in Africa, broadcasts in 153 territories to 54 million homes and a potential TV audience of 2 billion people. In the 2010–11 season, the average Botola Pro match attendance was 25,363, the highest of any professional football league in Africa, and stadium occupancy was 92% capacity. The Premier League ranked second in the CAF 5-Zaers of leagues based on performances in African competitions over the last five years. Of the 16 clubs to have competed since the inception of the Premier League in 1992, five have won the title: Wydad Casablanca (19), Association Sportive des FAR (12), Raja de Casablanca (11), Magreb Fez (4) and Hašania Agadir (2). The current champions are Ittihad Tanger, who won the title in 2017-18. On 5 June 2016 FUS Rabat won the football championship for the first time after being runner-up to the title for 5 previous times. The Autoroute Casablanca–Agadir is a new main road in Morocco. Building began in 2000 and the road was inaugurated on 21 June 2010 by Prince Moulay Rachid.The road is 453 km (281 mi) long and connects the cities of Casablanca and Agadir through the city of Marrakesh and High Atlas mountains. The Council of Arab Economic Unity (CAEU) (Arabic: مجلس الوحدة الاقتصادي العربي) was founded by Egypt, Iraq, Jordan, Kuwait, Libya, Mauritania, Palestine, Saudi Arabia, Sudan, Tunisia, Syria, United Arab Emirates and Yemen on May 30, 1964, following an agreement in 1957 by the Economic Council of the Arab League. Lycée Français d'Agadir (LFA, Arabic: الثانویة الفرنسیة باکادیر‎, Tifinagh: ⴰⵙⵉⵏⴰⵏ ⴰⴼⵔⴰⵏⵙⵉⵙ ⵖ ⴰⴳⴰⴷⵉⵔ) is a French international school located in the Quartier Founty-Bensergao in Agadir, Morocco. It serves maternelle (preschool) until lycée (senior high school).On 31 August 2014 the Groupe scolaire Paul Gauguin closed, and students were moved to the LFA. The Hassan II Golf Trophy is a golf tournament in Morocco hosted by Prince Moulay Rachid. The tournament was named for his father, Hassan II, who served as King of Morocco. It was held at the Royal Golf Dar Es Salam in Rabat until it moved to Agadir in 2011. It moved back to Royal Golf Dar Es Salam in 2016. Hassania Union Sport Agadir is a Moroccan football club based in Agadir. The club was founded in 1946. They play their home games at Stade Adrar. This is a list of the busiest airports in Africa by number of passengers. Michael Philip Batt, LVO (born 6 February 1949) is an English singer-songwriter, musician, record producer, director, conductor and former Deputy Chairman of the British Phonographic Industry. He is best known for creating The Wombles pop act, writing many hits including the chart-topping "Bright Eyes", and discovering Katie Melua. He has also conducted many of the world's great orchestras, including the London Symphony, Royal Philharmonic, London Philharmonic, Sydney Symphony and Stuttgart Philharmonic in both classical and pop recordings and performances. Wrote and performed the track "summertime city" TV series 1970's. Saadeddine Othmani (Arabic: سعد الدين العثماني‎; born 16 January 1956) is a Moroccan politician who has been Prime Minister of Morocco since 2017. Previously he served as Minister of Foreign Affairs from 2012 to 2013. Souss-Massa (Berber languages: Sus-Massa, Arabic: سوس ماسة‎) is one of the twelve regions of Morocco. It covers an area of 51,642 km² and had a population of 2,676,847 as of the 2014 Moroccan census. The capital of the region is Agadir. Souss-Massa-Drâa (Arabic: سوس ماسة درعة‎) was formerly one of the sixteen regions of Morocco from 1997 to 2015. It covered an area of 70,880 km² and had a population of 3,601,917 (2014 census). The capital is Agadir. One of the major languages spoken in this region of Morocco is Tashelhit. In 2005, Rachid Filali of the prominent Filali family of Tafilalt became the Wali of Souss-Massa-Drâa. Adrar Stadium (Arabic ملعب مدينة أكادير/أدرار) is a multi-use stadium in Agadir, Morocco, that was inaugurated in 2013. It is used mostly for football matches. The stadium has a capacity of 45,480 seat. It was supposed to hold 2010 FIFA World Cup games if Morocco had been chosen to be the host country. The stadium is home to Association football club Hassania Agadir, replacing their old venue Stade Al Inbiaâte. It has hosted four matches of the 2013 FIFA Club World Cup in December 2013 and was one of the stadiums to be used for the 2015 Africa Cup of Nations. It is one of the 14 venues for Morocco's bid for the 2026 FIFA World Cup, it will host the Quarters-Finals if Morocco is awarded for the World Cup. The stadium was inaugurated on October 11, 2013, with a friendly match between local side Hassania Agadir and Algerian club JS Kabylie. Hassania's Saad Lemti scored the first goal in the stadium in the 76th minute of the match, as the hosts went on to win the match 1-0. Taroudant (Berber languages: Tarudant, ⵜⴰⵔⵓⴷⴰⵏⵜ; Arabic: تارودانت‎) is a city in the Sous Valley in southern Morocco. It is situated east of Agadir on the road to Ouarzazate and the Sahara desert and south of Marrakesh. The town is known as the "Grandmother of Marrakesh" because it looks like a smaller Marrakesh with its surrounding ramparts. In the sixteenth century, the Saadi dynasty briefly used Taroudant as a capital before it moved its royal seat onwards to Marrakesh. Today, the city has the feel of a small fortified market town on a caravan route. Taroudant is known for its local crafts, including jewellery and carpets. Unlike Marrakesh, almost the entire city of Taroudant is located inside its walls. A new part of the city is being developed outside the city walls around the campus of a faculty of the Ibn Zohr University of Agadir.